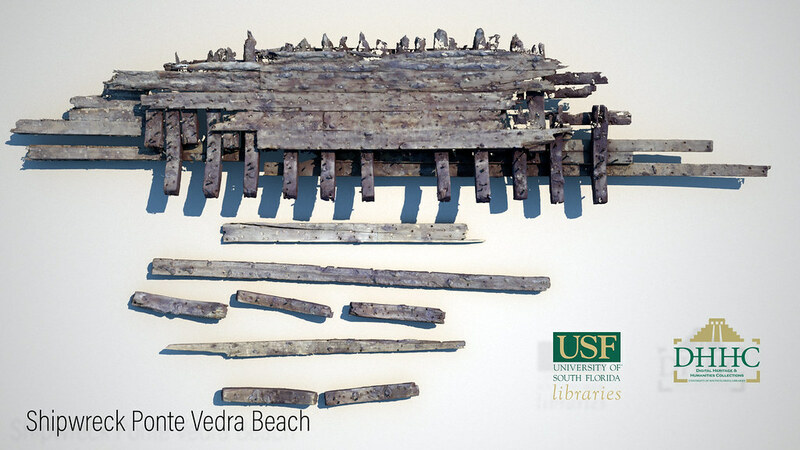 Documented with laser scanning, imaging, and GPS on March 31, 2018 by the USF Libraries 3D Researchers with the Digital Heritage and Humanities Collections (DHHC), this shipwreck came ashore four days earlier. Working in concert and collaboration with the Florida Division of Historical Resources and the Lighthouse Archaeological Maritime Program (LAMP), DHHC is producing accurate CAD and 3D models that will be used for archival, preservation, and research purposes. The Florida Public Archaeology Network worked to assist in our field project and outreach, helping with the interpretation aspects and public involvement. This collaborative research will produce information as to origin, design, and help with dating this historic wreck, and demonstrates applications for rapid assessment and sharing of data across platforms in 3D.